Reverse Locking PCB Support - 9.6mm Description: Material : Nylon 66, UL 94V-2. 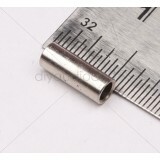 C..
High quality stainless steel spacer for mounting PCB. Dimensions (L x D) : 12mm x 5mm Hole..
Spacer - 12mm Threaded (Hex) Overview: High quality Hex spacer for mounting PCB. Techni..
High quality stainless steel spacer for mounting PCB. Dimensions (L x D) : 25mm x 5mm Hole..